Peacocks roam the luxurious island resort. A luxurious island resort known for its colonial façade and contemporary Asian design, Capella Singapore will set the stage and tone for historic negotiations between North Korean leader Kim Jong Un and President Donald Trump. The U.S. and North Korean delegations will be surrounded by verdant landscaping and roaming peacocks at the hotel grounds on Sentosa Island, a smaller island off the coast of the city-state and a 15 minute drive from downtown Singapore. The meeting place's location was announced on June 5, after weeks of speculation that it might occur in Sweden or the demilitarized zone between South Korea and North Korea. Singapore was also a likely choice: It has hosted past international summits with tight security concerns, like the 2015 summit between China and Taiwan, and it has ties with both the U.S. and North Korea. London-based architecture firm Foster + Partners repurposed colonial mansions built for the British armed forces in the 1880s with contemporary Asian design to create a modern, historic resort with a spa, golf course, and chic pools set amid a rainforest on 30 acres of land. The nine-year-old resort has many locations for potential talks: conference rooms that overlook the South China sea, and, according to the hotel site, four restaurants. There's the luxurious chef's table, a modern Cantonese restaurant, and an all-day Mediterranean cafe. Known for high-end service and privacy, the 111-room hotel is well reviewed by travelers. 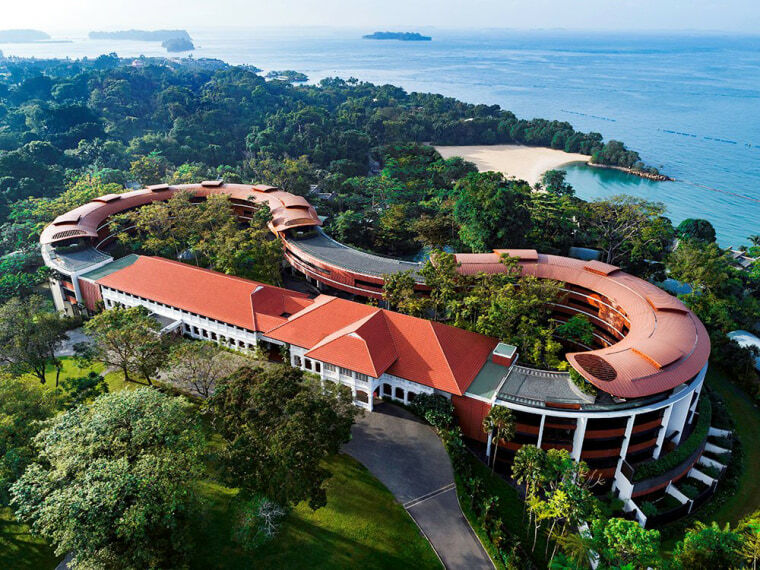 While the remote location of the hotel may help isolate the world leaders from the hustle of the main island, Capella isn't Sentosa Island's only attraction. It is also home to tourist hot spots including KidZania, an 81,000 square-foot sized kid-sized city where kids work at pretend jobs for pretend money, and Universal Studios Singapore. The hotel is completely booked through early July, but the resort lists rates starting at $624 Singapore dollars — around $467 U.S. dollars — per night in mid-July, a top time for tourists.